Having followed Fred Frith closely for a long time I've lost track of him in recent years (except for the Massacre reunion a few years back). But in addition to Fred's guitar this free-improv quartet includes Lesli Dalaba on trumpet, Carla Kihlstedt on violin, electric violin and Stroh violin, and Eric Glick Rieman on prepared and extended Rhodes electric piano. 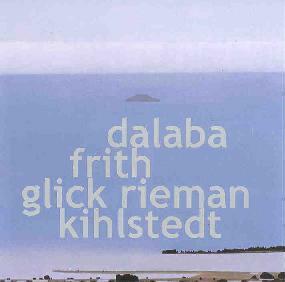 I had first heard Glick Rieman on his Ten To The Googolplex CD (see AI #18) with it's intriguing ambient soundscape explorations on the Rhodes. Dalaba has performed with Wayne Horvitz, Henry Kaiser, Elliott Sharp's Carbon, Eugene Chadbourne, Derek Bailey, among others. And Kihlsetedt has played with Philip Glass and the killer avant-prog/death-metal band Sleepytime Gorilla Museum (see AI #18). There are 4 relatively short tracks and 3 extended works on the CD, and it was a couple of the lengthier pieces that made the strongest impression on me. "Worm Anvils" begins sparse and quiet, yet is deceptively busy. But the musicians soon get more aggressive, with pounding basslines, low drones, almost theremin-like string manipulations, and other ambient elements that create a narrative that evolves throughout the 13 minute piece. Close attention is paid to the individual sounds and how they are produced, with careful emphasis placed on a single chord strum, trumpet note, or draw on the violin. The guitar takes on many faces, from melodic acoustic patterns to harsher gut wrenching runs. "Shallow Weather" surprised me with a pleasingly melodic folk music or string quartet feel to the music at the beginning of the piece. Of course all the usual sound manipulations are heard from every direction, and it soon develops into a drifting soundscape piece with gradually developing patterns that bring to mind a somewhat jazzier Philip Glass work. Probably the most accessible track of the set that nicely blends the "musical" and the abstract. In summary, the entire album is interesting in terms of creating sound and environment and how the quartet brings these elements together. But I found the music to be at it's best on the lengthier tracks where instead of a brief study the musicians could more fully develop both sound and theme (which could be surprisingly dramatic).